2017 saw the launch of IMPACT, a £4 million clinical trials network and the first of its kind in the UK. The programme is focused on improving stem cell transplant outcomes for patients through a network of clinical trials. 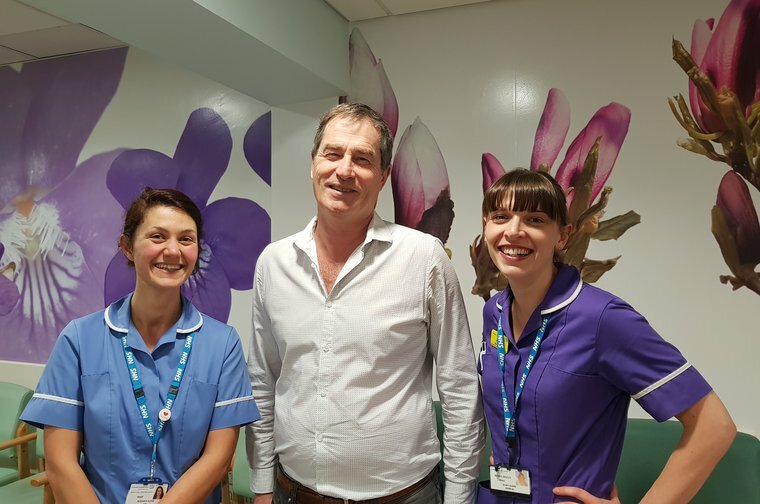 It’s ambitious, the first of its kind in the UK, and will encompass four years, 12 clinical trials and approximately 1,500 patients across the UK. Advances in stem cell transplantations mean almost every patient can now find a suitable donor, but the survival rates following a transplant are sadly lagging. Over 50% of adult transplant patients do not reach the five year survival mark following their transplant, which is why we donated £1 million to help fund this much-needed research. Professor Marks, could you tell our supporters a little bit about you and your role in IMPACT? Certainly: I am the senior transplanter at the Bristol Bone Marrow Transplant Unit. I’ve worked in Bristol for 21 years and have a particular interest in bone marrow transplantation and Acute Lymphoblastic Leukaemia. I was appointed in 2016 as Medical Director of IMPACT and I am here to help propose and review the trials, help set them up and then make certain they run safely. The trials need to be feasible: they need to have realistic end points, and most importantly, have the goals of improving outcomes for patients being transplanted for haematological conditions. IMPACT’s research is much-needed. Can you explain how it will help leukaemia and blood cancer patients in the future? The vast majority of IMPACT’s trials will be transplant trials for leukaemia or other blood cancers. Previously, only about 5% of patients transplanted have been entered on a clinical trial and therefore have not had access to these new therapies or new ways of doing transplants. Indeed, the goal of IMPACT is to at least double that number of patients on transplant trials and there will be 22 centres funded with an IMPACT nurse, whose job will be to identify the patient's, explain the trial to them and support them. All of these trials aim to improve outcomes but also they will improve our understanding of how these cancers work, how transplants cure patients and why transplants sometimes fail. And if we can understand why they fail, then we can improve them for future patients. IMPACT is looking to run 12 trials in total, and around three are currently underway. Could you tell us a little about them? Yes, certainly. The first trial that is up and running is at King's College London, and is called pro-DLI. DLI stands for Donor Lymphocyte Infusion. This is a trial for patients with Acute Myeloid Leukaemia (AML) who have had reduced intensity transplants and it’s aims to see whether giving further white cells from the donor can reduce the chance of the leukaemia coming back and improve the patient’s survival. The second trial is called ALL-RIC, a trial which I am heading. This is for patients with Acute Lymphoblastic Leukaemia (ALL). Most of these patients will be over the age of 40 and in our last our major ALL trial, called UKALL14, we found that these patients did very well with reduced intensity transplants and this improved their outcomes compared to chemotherapy. However, there was a significant chance of the leukaemia coming back. Before a transplant for ALL people receive chemotherapy, and in this trial we are seeing if changing this chemotherapy to a low-dose total body radiation and a drug named Campath can improve outcomes and reduce relapse without increasing toxicity in the body. The final trial, COSI, focuses on transplants in older patients with high risk Acute Myeloid Leukaemia (AML). This trial will look at improving chemotherapy treatment for AML transplant patients, and it will study the effects of a new drug called CPX on transplant outcomes. They sound like very exciting trials! 2018 will definitely be a busy year for IMPACT. What will be the key things for the programme to achieve in the upcoming year? By the end of the year we should have all three trials up and running and recruiting patients: IMPACT is aiming to accelerate the process of accessing clinical trials for patients. Alongside running the current trials, we also need to select the next three trials for the second year of IMPACT. How would a patient go about accessing the clinical trials? When a patient is approaching a transplant they can look at the IMPACT website and see if there is a trial in their disease area. There will be some information on the website about these trials and the goals of these trials. It is entirely open to patients to ask their consultants, and ask if they think they would be suitable and whether the one is available to them. Find out more about the research we fund, including IMPACT, in our research pages.